December 16, 2011, 6.00 pm. The Institution of Public Health Engineers, India, Kolkata Centre invited Manick Sorcar to give a technical talk on “Laser Lighting for Art, Animation & Entertainment” to their members. 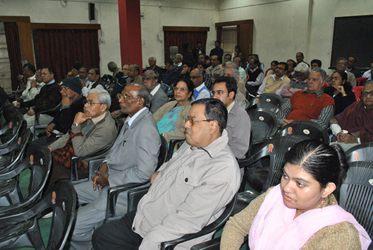 The talk took place at IPHE Hall, CK-58, Salt Lake City, Kolkata 700 091. 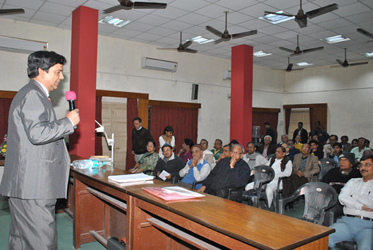 The function was presided by Mr. Prabir Kr. 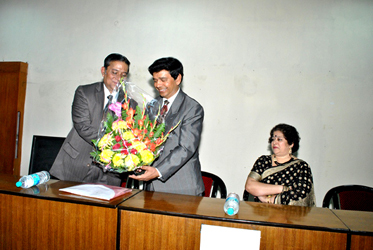 Dutta, former Engineer-in-Chief & Ex-Officio Secretary, PHE Department, Govt. of West Bengal, and Chairman, IPHE Kolkata Centre. The IPHE, India, Kolkata Centre twice had organized Manick Sorcar’s “Laser Fantasy” live-laser stage extravaganza for their members and families, which enjoyed phenomenal success. The first was in March and the second in October, both in 2011, at the India Government-owned prestigious Eastern Zonal Cultural Center (EZCC), Salt Lake, Kolkata. The technical talk was due to the enormous interest on laser animation at Manick's shows that was experienced by the IPHE members, most of which are engineers. Manick said, the fundamentals of laser projection can be summarized as follows: A white-light laser beam is passed through a polychromatic acousto-optic modulator (PCAOM), which splits the beam into two components—the desired beam and the waste beam. The desired beam then hits two small mirrors, first an x-axis scanning mirror, and then the y-axis scanning mirror, ultimately creating the image. The waste beam, which contains all undesirable or rejected colors, is dumped onto a black or opaque surface. He explained that the PCAOM, a solid-state device, can be imagined as a computer-controlled electric prism. It operates on a driver card that takes the incoming color control signal and converts them to a radio frequency (RF) signal that is fed to the cell. The cell is a crystal with a transducer bonded to it, at a precise angle into the laser beam. The white beam is passed through the crystal, the specific RF application results in specific wavelengths diffracted into first order. Acting as a bulk diffraction grating the PCAOM generates 16.7 million or more laser lines (color) at MHz speed, which are then added at different combination to create the desired output color and brightness for projection. He pointed out the fundamental difference in traditional and laser animation is that in the latter, all drawings are just line drawings without any filler. The lines are created with a series of digital points (animating, anchoring and blanking points) that are carefully dropped for the x-y scanners to follow. Like in traditional animation, pencil sketches of each frame is carefully drawn first. The success of a laser animation depends on how well these frames can be digitized with a minimum number of points so that the laser can “join the dots” to produce the best likeliness without any flickering. In conclusion, he explained in the era of computers, internet, email, and global commerce, the world is getting smaller. A creative mind can complete the animation at a home studio, and deliver it to another land just instantly! An approximate 30 minutes Q/A session followed after the technical talk. Vote of thanks was given by Mr. Tarun Kr. 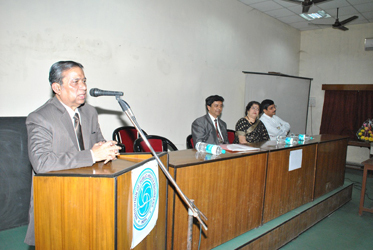 Dutta, Secretary, IPHE Kolkata Centre, before the session was adjourned.